High Performance Films Market size for 2015 was over USD 30 billion and is predicted to grow at over 6% by 2024. Changing consumer preference towards high tensile and durable packaging materials will drive the global high performance films market size from 2016 to 2024. Its high chemical resistant property with growing demand from end use industries including construction, interior decoration and food and beverage may further complement the industry growth. Rising demand for lightweight and easy to dispose food and beverage packaging is expected to positively encourage the industry share. Increasing demand for tetra pack products subject to its ease availability in different size and shapes and easy handling may further complement business growth. Increasing demand for coating doors and windows to ensure safety and security will influence the high performance films market size. The product offers various features including protection against UV rays, light control, high aesthetic value and temperature control. Polycarbonate, fluoropolymer, polyester and nylon are used to manufacture the films. The prices of these raw material are linked with crude oil index. Political instability in Middle East associated with crude oil index fluctuation may hinder the industry growth. Polyester high performance films market size for 2015 was over USD 20 billion. Rapid urbanization coupled with increasing investment in construction and housing sector will augment industry landscape. In addition, retail chain development in BRIC may positively impact the business. Nylon is predicted to witness growth over 4% by 2024 owing to its increasing demand from automotive, construction and food processing industries. Polycarbonate high performance films market share is set to cross 500 kilo tonnes by 2024 owing to its good impact resistance, high glass transition temperature and durability features. It is used in production of construction materials, automotive, aircraft, electronics component and data storage discs such as Blue ray disc, DVD, CDs. Barrier high performance films market size was for 2015 was over USD 15 billion and is predicted to witness a considerable growth owing to its oxidation resistance and moisture properties. It finds application in semiconductors and solar cells. Microporous market share is set to cross 4% by 2024 on account of its water repel, air penetration and moisture properties. Increasing demand for waterproofing materials from domestic construction may propel the business growth in future. Safety and security applications is anticipated to exceed USD 5 billion by 2024. Increasing spending in construction sector coupled with stringent regulatory standards towards domestic infrastructure development in Middle East and BRICS is expected to positively encourage the business outlook. Packaging applications were valued at over USD 20 billion in 2015. It finds applications in oxygen scavenging, vacuum packaging and low oxygen technologies in meat processing industries. 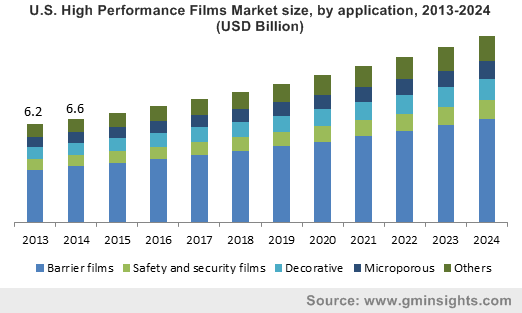 High performance films market share demand from electrical and electronics will witness strong growth on account of its low friction coefficient, chemical inertness, dielectric and low moisture absorption properties. It finds applications in cable insulation, microphone and photovoltaic. The global revenue generated from construction is predicted to reach over USD 3 billion by 2024.These are used to enhance aesthetic and functional properties. Asia Pacific high performance films market size for 2015 was valued above USD 9 billion. Rising automobile production primarily in China and India coupled with availability of cheap skilled labour and low manufacturing cost is expected to augment the industry landscape. North America, market size is expected to exceed USD 16 billion by 2024 owing to expansion of food and beverage facilities. Increasing demand for barrier films from semiconductor and solar cell manufacturing industries subject to its moisture resistant property may propel business growth. Europe market accounted for 28% of volume share in 2015 and is expected to witness significant growth by 2024.Increasing demand for packaging may favour the industry growth during forecast period. Key industry players include Dow Chemical, Bernis, Evonik, Du Pont, Covestro (Bayer Material Science) and Eastman, Clopay Plastic, Sealed Air Corporation, Honeywell and 3M. Companies may undergo strategic collaborations or partnership with third party vendors such as, wholesalers and vendors. In 2012, Eastman Chemical Company collaborated with Solutia with the aim to expand its geographical presence. Nylon films are primarily used for packaging, automotive, personal care and electronics industries. High Nylon cost over other polymers such as, polycarbonate and polyester may hamper the business growth in future. Excellent stiff resistance and high durability property of polyester films makes it favourable for packaging industry. Moreover, It is widely used in electronics, construction and food packaging industry owing to its easily printable features. Increasing demand for fluoropolymer films from aerospace industry owing to its high mechanical toughness, excellent thermal and corrosion resistance properties.